The SNP has accused Danny Alexander of ‘rank hypocrisy’ on supporting air services in Inverness – having made no attempts to help the industry while in government. Speaking at First Minister’s Questions, Alex Salmond said flights to and from Inverness are “essential for economic development” and that Flybe’s recent announcement of the sale of its slots at Gatwick underlined “the absolute necessity for APD to be devolved to this parliament”. “We should remember in context that Danny Alexander is a Liberal Democrat so adopting two positions at the same time may in itself be a part of party policy. “But I think it is for the Chief Secretary to the Treasury and local member for Inverness a rather invidious position to be responsible for the very Air Passenger Duty and taxation which is driving and threating services in Inverness and then complaining about it and posing as the defender. “In 2008 Danny Alexander campaigned for more services to and from Inverness to Gatwick but has done absolutely nothing in government to support these very air services he once fought for. “That is rank hypocrisy – how can he tell the people of Inverness, particularly in the position he holds, and say he is doing everything to help the economy in Inverness? “It has been made clear Flybe’s announcement was entirely of Westminster’s making – we have said time and time again the budget hike in Air Passenger Duty would be damaging for Scotland’s airports and the wider economy. “It was the SNP that told Westminster that increasing the cost for airlines to fly to Scottish airports is the last thing they need – but they went ahead and did it anyway. “It is clear Mr Alexander puts the Treasury’s interests ahead of what is in the best interests of the Highlands and Islands. Banffshire & Buchan Coast MSP Stewart Stevenson has welcomed comments from former Chancellor of the Exchequer Denis Healey in which he confirms that the UK Treasury played down the extent of Scotland’s oil reserves in the 1970s. Denis, now Lord, Healey was Labour Chancellor of the Exchequer during the time the St Fergus Gas Terminal and Cruden Bay oil pipeline were being constructed. This follows his admission that the Treasury purposely played down the extent of Scotland’s oil reserves in the 1970s because of UK Government opposition to Scottish independence. “These welcome remarks by Lord Healey should silence the No campaign - which daily denigrates Scotland's abilities to be an independent country. Even David Cameron accepts that Scotland can be a 'successful, independent country'! "Denis Healey, a former Labour Chancellor of the Exchequer, also agrees with the SNP Government that a sterling area would be in the interests of the rest of the UK as much as in Scotland’s interests. "These are common-sense statements of reality by Lord Healey – a distinguished public figure who now has no political axe to grind in Scotland - and they stand in stark contrast to the arrant nonsense being peddled by George Osborne and Michael Moore, and regurgitated by the No campaign. “Scotland can grasp the opportunity that 18 September 2014 represents – we cannot afford to find ourselves in the same situation as now and in the past, misled by a Westminster system which puts its own interests ahead of Scotland's. We may have been fooled once before by Westminster, but we will not be fooled again. Local MSP Stewart Stevenson paid a visit to the Royal National Mission to Deep Sea Fishermen in Peterhead on Friday to present a cheque for £100 to Mission funds. 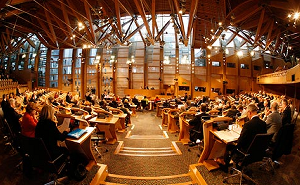 The MSP recently took part on an opinion survey for market research company MORI which offered a fee for taking part. Mr Stevenson opted to donate his fee to local good causes and on this occasion it was the Peterhead Mission who benefited. During his visit to the Mission, Mr Stevenson was briefed by Superintendent Steve Murray and Chairman Ross Gordon on the support work carried out there. “It was good to catch up with the Mission once again. My first ever public engagement as an MSP after I was elected in 2001 took place at the Peterhead Mission so it is a special place for me. “I was delighted to be able to contribute in a small way towards the good work which the Mission does. I get asked to take part on three or four of these type of surveys every year which normally pay a fee and I always like to nominate a local worthy cause to benefit from the fee. Stewart Stevenson, SNP MSP for Banffshire & Buchan Coast this week welcomed the Primary 7s of Whitehills School to the Parliament. The pupils were given a tour of the Parliament building before engaging in a question and answer session with the local MSP. The discussion covered a broad range of subjects, with the MSP fielding questions from the pupils on everything from the life of a MSP to current political issues. “It is terrific to see these young people taking such an active interest in the political system which surrounds us, and I’d like to thank the teachers and pupils of Whitehills School for visiting. “It is useful for the people of Banff and Macduff to at last have some clarity from Tesco and Aberdeenshire Council as to the likely timescales involved, but I think most people now just want to see things move forward. 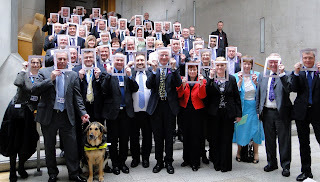 Stewart Stevenson, SNP MSP for Banffshire and Buchan Coast joined with his fellow MSPs to put themselves in the picture about epilepsy issues. 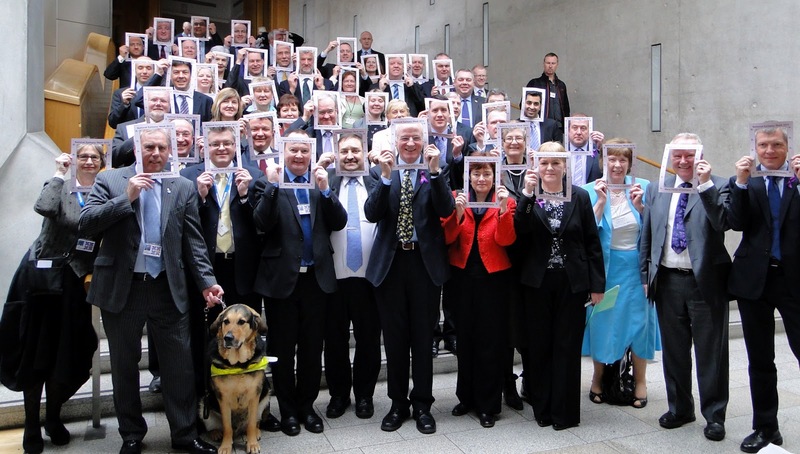 They framed their personal support for 54,000 people living with epilepsy in Scotland with a National Epilepsy Week (19-25 May) group photo to help highlight this year’s ‘many faces of epilepsy’ theme. Local MSP Stewart Stevenson has written to Tesco’s Chief Executive regarding the lack of progress with the long-planned development in Banff. The move by Mr Stevenson comes following reports that Tesco have applied for planning permission to extend the date by which development works must commence. "It seems as if this long-running saga is never-ending. "The lack of progress has effectively "frozen" a part of Banff which was in dire need of renovation and redevelopment ten years ago. "It's now over eight years since I organised a referendum in Banff and Macduff which gave a clear signal to Tesco that this is something which had majority support within the local community. Tesco are in serious danger of squandering the goodwill they had at that time if some action is not taken soon and I have written to their Chief Executive urging the company to apply some urgency to resolving this." Stewart Stevenson, SNP MSP for Banffshire and the Buchan Coast, welcomed the figures published in a monthly North-east economic report. From January 2012 to January 2013, the number of people claiming unemployment benefits in the whole of the North-east fell by 14.4%. During the same period, Fraserburgh saw an impressive 28% drop, while Peterhead saw a drop of 20.1%. The current Aberdeenshire unemployment rate of 1.2% is the lowest of all the local authority areas in Scotland. The comparable rate for Scotland overall is 4.1%. “Scottish Government initiatives such as record numbers of modern apprenticeships and the small business bonus scheme, which has allowed companies to invest in recruiting staff, have contributed to these low levels of unemployment. A new paper on the implications of independence for energy consumers has today demonstrated the opportunity that an independent Scottish Government would have to lower consumer energy bills. The paper published for the David Hume Institute outlines the opportunity that an independent Scotland would have to use money generated from the EU Emissions Trading Scheme to fund energy efficiency measures. “This paper is an important contribution to the debate and clearly sets out the substantial opportunities that an independent Scotland would have for a new approach on energy. “By taking the steps that Westminster will not, we would have the opportunity to reduce consumer energy bills while supporting energy efficiency measures. “The coming referendum is all about the opportunities that having the powers to make our own choices will give us and this paper provides clear examples of the kind of steps an independent Scotland could take to help hard-pressed energy consumers. “Scotland has the opportunity to be a renewable power-house of Europe, creating jobs and massively boosting Scotland’s economy. Banffshire & Buchan Coast MSP Stewart Stevenson has welcomed the Education Scotland report regarding the Boddam nursery, Buoys and Gulls Nursery. The nursery was awarded two ‘very good’ ratings and one ‘good’ grade in the overall judgement by Education Scotland. Inspectors granted Buoys and Gulls Nursery ‘very good’ ratings for the assessment categories of ‘Improvements in performance’ and ‘Children’s experiences’. The ‘good’ award was for ‘Meeting learning needs’. 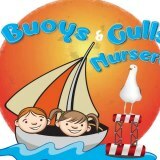 “I am pleased to see that the hard work of the staff at Buoys and Gulls Nursery has been recognised by Education Scotland. “Inspectors found the children at the nursery to be enthusiastic and making good progress in their learning, which I am delighted to note. “Education Scotland have also rightly commended the work that staff have put in to nurture a caring environment for the children at the nursery, and create good partnerships with parents. Stewart Stevenson, SNP MSP for Banffshire and Buchan Coast has welcomed improvements to Scotland’s planning system which will ensure that even more emphasis is placed on using the planning system to secure jobs and economic benefits while protecting Scotland’s scenic areas. The changes are intended to strengthen environmental protection in the 31% of Scotland classified as the wildest and most scenic land, and preventing any wind farms from being built in the areas covered by National Parks and National Scenic Areas. Additionally, the Scottish Government has proposed increasing the separation distance between wind farms and cities, towns and villages. The latest National Planning Framework (NPF3) also identifies key projects of national importance to Scotland, including carbon capture schemes such as the one at Peterhead, as well as improvements to Scotland’s airports; high speed rail; infrastructure for offshore renewables; and a national cycling and walking network. NPF3 looks to smooth the development and delivery of these projects, as well as maintaining a focus on economic recovery throughout. “The announcement today will be transformative for Scotland’s planning system, and will safeguard our country’s natural beauty and eco-system, while ensuring we can continue to develop pioneering infrastructure and technology. “The new national planning framework has, at its heart, the principle of delivering sustainable economic growth in order to maximise the country’s attraction to investors and visitors in a global economy.